With that we wrap up yet another month. Tomorrow is a new month! Let's come prepared for new blessings! Gladness and joy will overtake you, sorrow and sighing will flee away. Trials could be overwhelming. Every human being suffers one way or another. Daily decision making, child rearing, balancing workload, relationship issues, physical health, financial needs could all add to our trials. Many run away from the Lord, during tough times, instead of clinging closer to the Lord. They might even go to the extent of denying their faith to satisfy their own agenda and come to their own conclusion of matters. But enduring the trials with steadfast faithfulness on God Almighty, will surely be rewarded. Attitude is key in all. How we handle our trials? How we react to temptations? So, let us too hold fast to our faith. Stand firm through our tests. Persevere under trial, to seek refuge in Him and Him alone! One thing that truly amazes me is a Water Fall. It seems almost magical to see water gushing out between huge rocks. Does it not? During the Exodus the Israelites experienced it first hand - water came gushing out from the rocks in the desert, not just little - but as abundant as the seas! Can you imagine that? Same way our Lord can provide for our needs out of any rocky situation where there seems like no way out. Not just a little; but as abundant as the oceans! Praise the Lord! Thought sharing a video of a waterfall will help us understand the context better... As you enjoy the video be reminded that the Lord who met our needs in the past is still capable of meeting our needs in the present and the future! So, let's stop worrying and start praising the Lord's holy name. Within such Streams of Living Water will flow abundant blessings for others; in turn we will be blessed too. Amen! Let's praise Him; shall we?! Let us pray that not a single drop of His blood go wasted but save the mankind for which it was shed. He is our Rock and Living Water flows from Him. Let us pray that not a single drop of this flowing water go wasted but refresh the weary souls of the mankind. Let us remember His sufferings not just today, but every single day! Blessed Good Friday to you all! As we are in the passion week remembering the suffering of our Lord and Savior Jesus Christ, it is only fitting to meditate on the Scriptures from 'ground zero', at the very scene where the events took place. Whatever you are thirsty for today, He is capable of fulfilling it. But first, let us make an effort to give our hearts to Him to quench His thirst at the cross, thus in turn quenching our own thirst or void or wants. He is the Spring of Living Water;yet He thirst for our connection with Him. Do I have any ancient doors that are shut for my King? Lift up your heads ... - The repetition here is designed to give force and emphasis to what is uttered. The response is slightly varied both times; but the same general sentiment is expressed. The design is to announce in a solemn manner that the symbol of the divine presence and majesty was about to be introduced into the place of its permanent abode, and that this was an event worthy to be celebrated; that even the gates of the city should voluntarily open themselves to admit the great and glorious King who was to reign there forever. In Revelation 3:20 we read, "Here I am! I stand at the door and knock. If anyone hears my voice and opens the door, I will come in and eat with him, and he with me"
Imagine our King standing at the door and knocking... Shouldn't we all open our gates for Him already? Happy Palm Sunday everyone! Let's sing Hosanna to our King! Father God is our Father in Heaven, the Alpha, the Omega, the beginning and the end - whom no one has seen face to face except for Jesus Himself. Jesus Christ is the Son who was born without sin in human form to die for the sins of you and me. Jesus was crucified as a flawless lamb, as a sacrifice for our sins, resurrected the third day, ascended to heaven and lives forevermore intermediating between us mortals and God the Father. Many times we talk about only the love of God and forget how powerful He really is. He is Almighty! All Powerful! Yet loving! Isn't that something?! Psalm 81: 7 says, "You called in trouble and I rescued you; I answered you in the hiding place of thunder...". Let's remember this as we start the weekend. "Now the Jordan is at flood stage all during harvest. 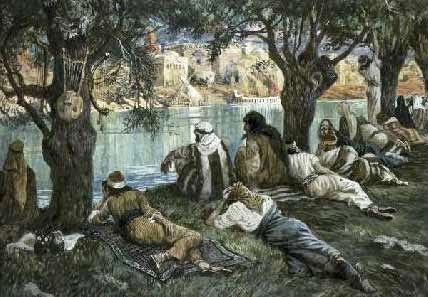 Yet as soon as the priests who carried the ark reached the Jordan and their feet touched the water’s edge, the water from upstream stopped flowing. It piled up in a heap a great distance away, at a town called Adam in the vicinity of Zarethan, while the water flowing down to the Sea of the Arabah (the Salt Sea) was completely cut off. So the people crossed over opposite Jericho. We are all familiar with the two builders Jesus spoke about in His mountainside preaching in Matthew 7. 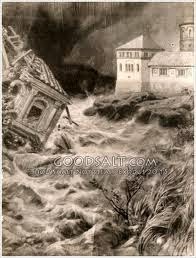 The wise builder built his house on the rock which withstood the heavy downpour of rain, floods and the wind. The other house which was built on the sand could not withstand these natural forces of elements and the builder is referred to as foolish. Happy Monday all! His mercies are new every morning! Every week! Every Monday! Amen! Land that drinks in the rain receives the blessing of God. Wishing everyone a wonderful "Son"day! Once again a beautiful scripture here on rain but this time rain is symbolized as the Word of God. It is not a mere interpretation by man; but by God Himself through Prophet Isaiah, which makes it even more special. If we faithfully obey His commands, He will send rain on our lands in its season. Let us stop worrying about the seasons that are going to come. Let us just obey His commandments; God will send us the rain even where it doesn't seem possible. He will provide for our retirement, for our children's education, for all our needs; in its season the showers will be sent from heaven. Dear Father in Heaven! We praise your name as we begin the 4th month in this new year Lord. Thank you for your provisions in the last three months Lord. Thank you that you are going to provide for us throughout this new month too Lord. Dear Lord, the scripture asks us to ask for rain Lord. We are here gathered in your name - asking for the rain you have promised us Lord. Please send your rain at this very moment Lord, this very day Lord. Thank you Jesus! Please send the rain according to each need we have brought to your feet this morning Lord! Please Lord, we know you are mighty to save! We know your promises are ye and amen! We know you said if we ask we will receive it Lord. Now we are asking Lord. We do believe you are sending us the showers Lord. Please Lord, let the people not be disappointed Lord. Please meet their needs Lord. You alone can do it Lord. Send them the much needed rain Lord! In your beloved son our beloved Savior Jesus Christ's name we pray, Amen! As we enter April, I thought it will be a good idea to discuss the many showers scriptures talk about in various aspects, hence the series: 'April Showers of Blessings'. This is a repeat from a couple of years ago, but trust me His grace is new every morning and I am sure the Holy Spirit will teach us something new each time we repeat/learn the same Scriptures.